How does our circadian rhythm affect athletic performance? Mark Taylor (@coolerking198 on twitter) recently asked me to research the affect circadian rhythms have on athletic performance. What on earth is that I thought!? So he sent me a piece of research to start me off. It is such a big topic, that I think I am going to have to tackle it over a series of blogs. This time, I will try and explore what exactly the circadian rhythm is, how research has shown it to be linked to sporting performance. Next week, I will go on to explore how it can affect our daily lives (shift work, jet lag, for example) and explore whether we can exert any influence over the circadian rhythm, or in fact, change it completely. My night shift worker husband would disagree with that last point! Until I was given this topic, I didn’t even for a moment consider the daily cycle may have an effect on performance, but I guess, logically, it should. I just thought that in the evening you were tired, therefore you would expect to not perform as well. It seems, though, that Circadian rhythm is generated in the hypothalamus (Smith, Guilleminault and Efron, 1997) and the direct affect this has is much more biological than that. 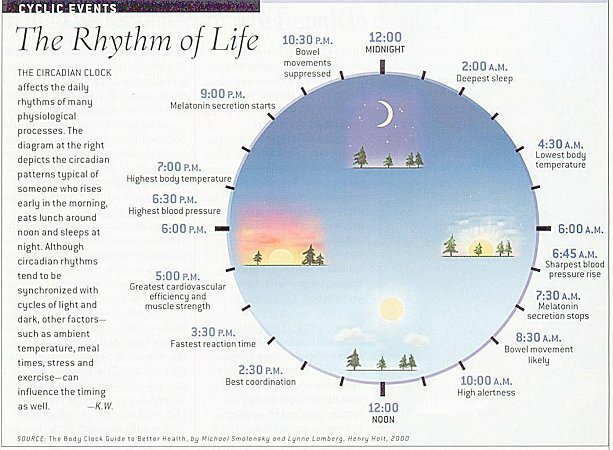 Not only is circadian rhythm generated in the brain, it is also NOT ruled by the earth’s cycle of daylight / night time, (although it is influenced by it) because it is biological, not astronomical. (Bear, Connors and Paradiso, 2007) This would suggest that the mere presence of daylight is not the sole contributing factor. It also has a genetic component. I will explore this topic further, and look into whether we can alter the circadian rhythm in any way. What has all this got to do with sporting performance? It seems circadian rhythm has a wide range of influences over our lives: sleep-wake cycles, hormone release, body temperature, metabolism, and many other processes through our body’s exposure to sunlight and darkness (Medarov). Daily fluctuations of cognitive and physical performance have been researched, documented and related to times of the day. The initial research I was sent was done on NFL team results in America. East and west coast team results were compared. West coast teams, who played their games at 6pm (peak athletic performance time) were found to win more matches than East Coast teams, who played at 9pm, closer to the Human Performance Nadir. There is a flaw in this research, however. They state that they give the teams points according to the strength of their side, to equalise results, but do not state how they do this. Therefore I looked for further evidence. This research, done on cyclists, also found that the peak performance time of day was around 6pm. Although this study disagrees with the time of day that is the ‘human performance nadir’ they do also confirm that the peak performance time of day is around 6pm, this one being rlated to peak lung function. Again, this publication on circadian variations in sports performance also states that the peak performance time of day is around 6pm. It seems that there is a plethora of research to support the idea that our natural biological makeup dictates that on the whole, we perform best at around 6pm. For me this is not too helpful, because all my races start at 6 or 7 AM!! So what can I do about this? Is there anything that I can do, or am I stuck with it? Can we influence our circadian rhythm? Return next time to find out!